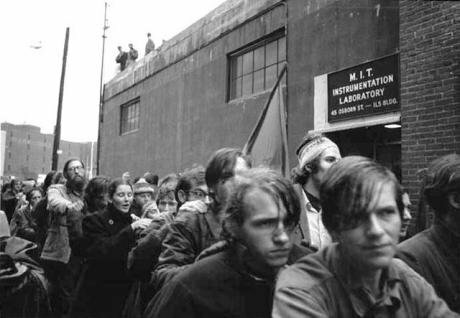 Protesters demonstrate outside one of MIT's nuclear missile laboratories, November 1969. Courtesy of MIT Museum. All rights reserved. In my previous articles, ‘Chomsky’s Choice’ and ‘Why Chomsky felt “guilty most of the time”’, I described the linguist’s double-edged relationship with the US military. Chomsky’s research at the Massachusetts Institute of Technology was sponsored by the US Defense Department, who had ambitious military applications in mind. On the other hand, Chomsky loathed the American military and all its works, and needed to know that no ideas he came up with could possibly be of military use. His political conscience led him to adopt a lofty, unprecedentedly other-worldly approach to language, treating grammar as if it were a mathematical object and, at every stage, renouncing messy reality in favour of the most extreme theoretical abstraction. My aim has been to show how Chomsky’s twin intellectual outputs – abstract theory for the military, concrete activism against the military – are best viewed together as a unitary strategic response to what must have been genuine dilemmas. Only a grasp of Chomsky’s conflict-ridden institutional situation can explain why he needed to adopt such extreme positions on each side. Language, he has always argued, is neither social nor communicative but simply a computational object performing its unconscious operations silently in the individual mind/brain. His commitment to such a peculiarly individualistic, dehumanised and unrealistic philosophical approach has embroiled him in countless theoretical difficulties over the years. One major advantage, however, was that it allowed him to disconnect his socially aware activism from an allegedly value-free, politically neutral version of linguistics emanating under military sponsorhip from MIT. Once this disconnect had been achieved, his activism could proceed free of interference from his science, and conversely his science free of interference from his activism. In his commentary on my two articles, the intellectual historian Randy Allen Harris claims that my whole argument is based on nothing more than ‘speculative psychobiography’. My error, he says, is to assume a significant and interesting connection between the two sides of Chomsky’s life. Perhaps, suggests Harris, the uselessness of Chomsky’s linguistics is no more than a personal foible, like his ‘fondness for cable-knit sweaters’ or the fact that he ‘prefers his jeans rolled up.’ Maybe, he says, ‘these are just some things that are true about Noam Chomsky, sort of like his linguistics is pretty unusable, and he loathes the American military.’ So my attempt to makes sense of such things is basically a waste of time. Why not accept that people’s various likes and dislikes are mostly a jumbled mess, with Chomsky in this respect no different from anyone else? 1. The American military did indeed ‘lust after’ Chomsky’s linguistics, throwing handfuls of money at it in the hope of command-and-control military applications. 2. Chomsky loathed the American military. 3. Over time, his picture of language morphed from a system of highly specific rules to successively revised models which were increasingly impractical if not totally useless. Harris recognizes these facts, but challenges my claim to discern any interesting connection between them. So how does Harris explain what he describes as ‘the apparently decreasing usefulness of Chomsky’s work over the decades’? Dismissing the possibility that the anti-militarist Chomsky might have been quite happy to disappoint his military sponsors in this way, he claims that better reasons are to be found in the history of science. For reasons which are unclear to me, Harris treats ‘the history of science’ not as a field rich with insights into how individual scientists come to personify larger social and institutional forces, but as a collection of entertaining tales about the idiosyncrasies of individuals. Harris describes Chomsky as one of those brilliant innovators throughout history whose pioneering theories, although seemingly full of promise, just happened not to work. Failure in science, he reminds us, always leads to instability – to false starts, re-analyses, disputes and endless change. Harris is perhaps the No. 1 expert in documenting the labyrinthine twists and turns taken by Chomsky and his critics during the second half of the twentieth century, and the final section of his commentary makes interesting reading for that reason. But despite the complexities, Harris’ basis for rejecting my argument is simple. Since Chomsky’s models were useless from the start, my efforts to explain their increasing impracticality are simply not required. While I enjoyed Professor Harris’ thoughtful response to my article, I am still puzzled by his claim that I rely for my argument on ‘speculative psychobiography’. He suggests, for example, that I ‘connect the dots’, linking Chomsky’s linguistic theories with his passionate anti-militarism by ‘drawing a line to childhood trauma or adolescent disappointment’. But nowhere do I indulge in psychological guesswork of that kind. Yes, I set out from Chomsky’s own explicit claim that his mind is unusually compartmentalised, such that his linguistics gets produced in one modular region (the ‘science-forming capacity’) whereas his political thought emanates from a quite different part of his brain. But to explain this, I point not to childhood or adolescent traumas but to events in Chomsky’s adult life which we can know about because they are on public record. Far from seeking to explain a key moment in western intellectual history as a consequence of one person’s psychology, my arguments are sociological, political and institutional throughout. Chomsky was working for the US military while on moral grounds detesting that same military and all its works. My point is that anyone in such a situation, irrespective of their childhood or personal psychology, would feel conflicted as their paid employment tugged them in one direction even as their political conscience pulled the other way. My interest goes well beyond Harris’ focus on Chomsky as an interesting individual. I am attempting to explain Chomsky’s part in the postwar overthrow of behaviourism and the dramatic triumph of the so-called ‘cognitive revolution’. Chomsky was a key player in this momentous paradigm change which placed mind over matter in a completely new way, while giving massive weight to the idea that science is a non-political endeavour, its theoretical accomplishments wholly disconnected from social or political concerns. Contrary to legend, Chomsky did not singlehandedly accomplish the overthrow of behaviourism. This profound intellectual development – as I explain in my book, Decoding Chomsky – had deep social and political roots. Yet with his anti-militarist credentials, Chomsky played a crucial role, providing – as no one else could – the necessary appearance of political neutrality and legitimacy to the new scientific paradigm. According to Harris, I attribute Chomsky’s turn to public anti-militarist activism to ‘a revelation of some kind’. But the explanation I offer is not a psychological revelation but the nature of the work he was increasingly being expected to do. Here is a little-known fact. Between 1963 and 1965, Chomsky found himself acting as a consultant for the MITRE Corporation on a project to apply his linguistic insights to something quite unpleasantly practical – the development of computer programs for purposes of weapons command-and-control. In my openDemocracy article, by way of evidence, I provide actual student recollections, some taken from e-mails written to me just a few months ago. These are corroborated by official MITRE documents which confirm that Chomsky was a named consultant on this Air Force-sponsored military research project. How do we know that Chomsky felt uneasy about what he was doing? Far from indulging in ‘speculative psychobiography’, I have gone to some lengths to provide compelling evidence. From the mid-1960s Chomsky gave serious consideration to ‘resigning from MIT’ on conscientious grounds. Although he was throwing himself into anti-militarist activism at this time, he was still far from happy with his response to the Vietnam War, insisting that: ‘No one who involved himself in anti-war activities as late as 1965, as I did, has any reason for pride or satisfaction’, and that: ‘I feel rather guilty for having waited this long’. In 1968, he admitted to the New York Times that he felt ‘guilty most of the time’, later repeatedly stating that he became involved in anti-war activism because ‘I couldn’t look at myself in the mirror anymore’. And then, when asked by a friend if he had any regrets about his life as an activist, he could only reply: ‘I didn’t do nearly enough’ . Now, it could be argued that these quotes merely show that Chomsky felt guilty about being a US citizen during the Vietnam War, not that he felt any unease about working directly on a military project at MITRE. But, as I also show, in 1959 when his wife Carol began working on an Air Force project to communicate with computers in English, Chomsky made clear that he felt ‘very nervous’ about the morality of any such work. He asked the project leader for reassurance that his wife would not end up working on voice-activated command and control systems for the military. Since the US Air Force-sponsored MITRE project for which he was later a consultant had similar motivations, I don’t think further evidence is required. As an intellectual historian, Harris specializes in providing detailed descriptions of personalities, ideas and events. I respect that approach, but would argue that sometimes we can reach beyond descriptive adequacy in favour of a more intellectually satisfying goal – explanatory adequacy. Like other historians who take inspiration from Marx, I prefer that approach.